The boundary between treeless grasslands and grassy woodlands in the Dunkeld region. Source: Google Earth. Longevity is the iron lung of a woodland tree – life support for an ageing population. The woodlands of Dunkeld are among the most beautiful in the world. 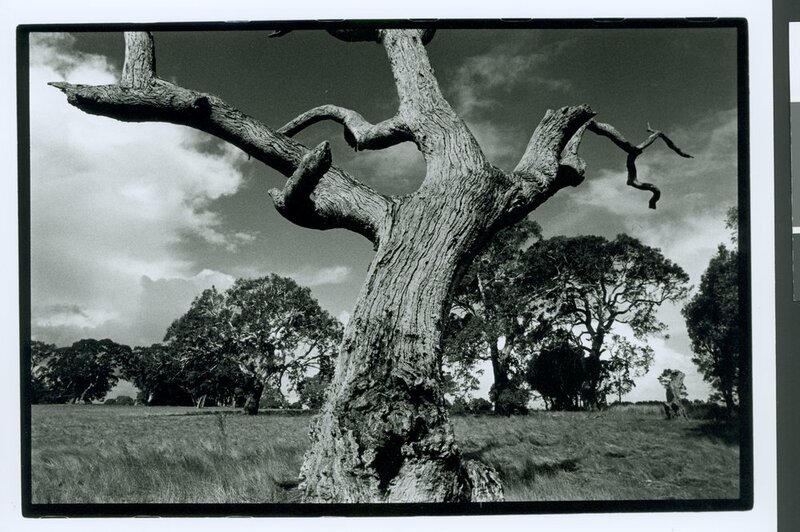 Stately old trees, scattered across grassy paddocks, frame the rugged Grampians Ranges in the distance. In another continent they could be oaks or olives, but in Dunkeld the trees are River Red Gums. Eucalyptus camaldulensis. Century old giants. The woodlands don’t go on forever, but peter out in the grasslands to the south and west. Sandy out-wash soils from the ranges allow trees to prosper. On the heavy clays further afield, grasses prevail. The boundary between the woodlands and the grasslands – the edge of the treed lands – is strikingly clear on air photos. Google Earth shows a ring of woodlands to the west, south and east of the Grampians, with farmed grasslands beyond. But how stable is this boundary? Is it moving over time? In many regions, paddock trees are gradually dying out, creating a “tree regeneration crisis”. If this was the case at Dunkeld then the boundary would creep slowly in towards the ranges. Beautiful old red gums dominate the grassy woodlands of Dunkeld. The red gum photos are by Richard Crawley and are taken from the National Library of Australia’s Trove website. To check the boundaries, I studied the 1940s air photos, the earliest record I have of the region. I re-sized a 1948 air photo so it overlaid the latest image from Google Earth, traced the boundary on the 1948 photo and superimposed it on the Google Earth image. To be honest, I was surprised at the result. Over the past 65 years, the Dunkeld woodlands haven’t shrunk. They haven’t expanded either. In fact, the boundary between the grasslands and the woodlands hasn’t moved an inch. The western boundary of the Dunkeld woodlands in 1948 and 2013. 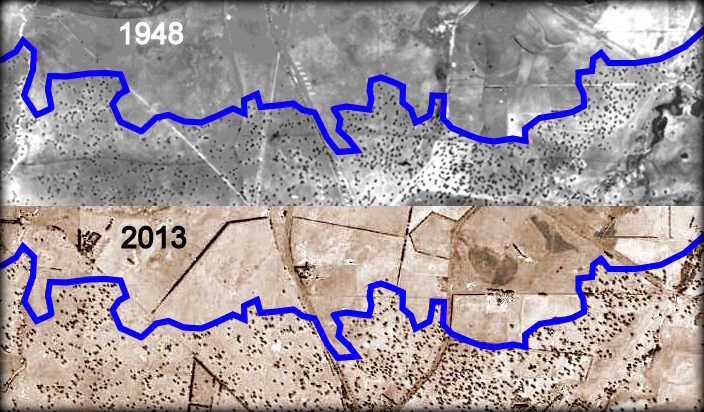 The blue line was drawn on the 1948 air photo and copied onto the 2013 photo. The boundary has remained surprisingly stable over 65 years. This view is 7.3 kms wide. Click on the image to enlarge it. Not only has the boundary stayed stable, but each and every tree looks the same in both photos. This stability is more obvious if we zoom in for a closer view. The photo below shows a paddock south of Dunkeld in 1948. 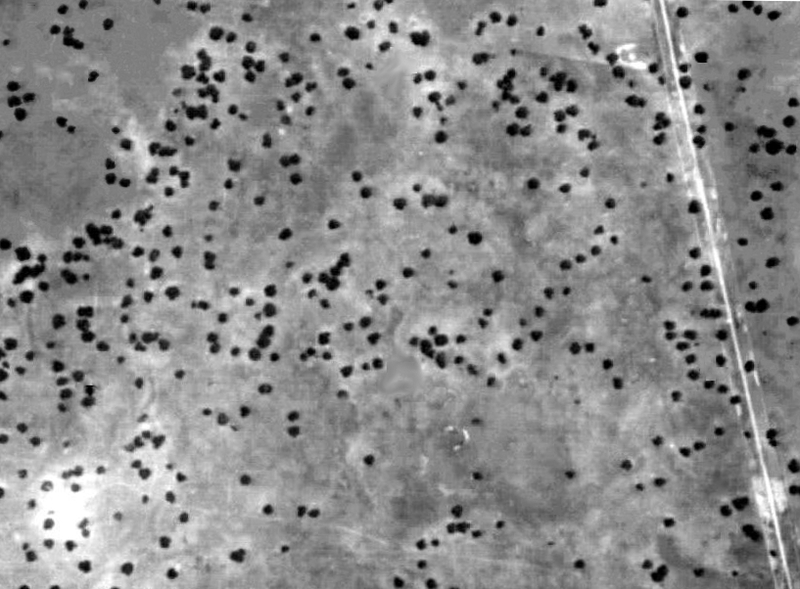 I selected this area because the old photo was clear and easy to examine, and most paddocks in the region show similar patterns and changes. 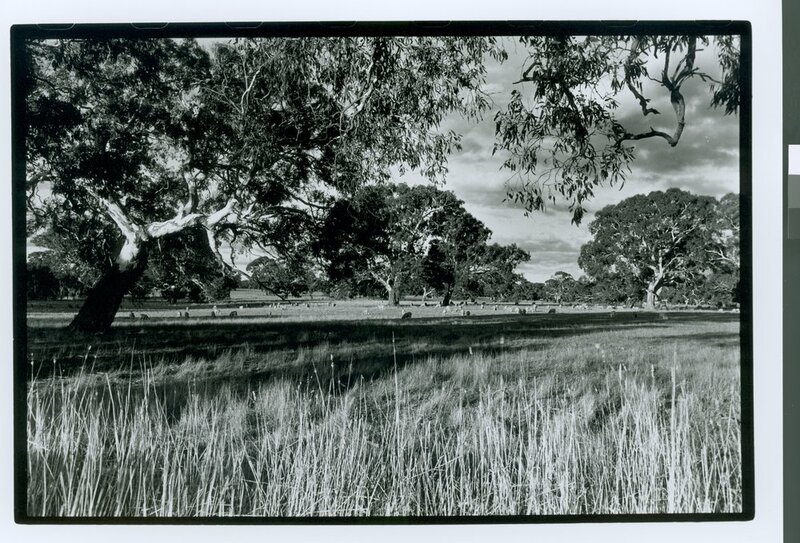 Paddock trees south of Dunkeld in 1948. This view is 1.6 kms wide. The roadside on the right seems to have been heavily grazed in the 1940s, as there’s more bare ground on the road verge than in the paddocks. Back then, there wasn’t any strip of roadside trees. There may not have been much “roadside vegetation” to speak of. The same paddock 65 years later, in 2013. This view is 1.6 kms wide. Photo source: Google Earth. Sixty-five years later, the landscape has changed a bit. There’s a new home, shielded by planted windbreaks and gardens, plus a new road in the south. But the biggest change isn’t in the paddocks, it’s along the roadsides. Strips of dense trees now line the roads to the east and south. The grasses are darker along the roadsides than in the paddocks, indicating that the roadsides (and a fenced lane-way in the north) are now grazed less heavily than the paddocks. Inside the paddock, not much has changed beyond the homestead area. With some digital trickery, we can compare the trees across the two images. On the photo below, I’ve overlaid all of the trees that were present in 1948 (in red) with all of the trees that are still standing in 2013 (in blue). I’ve offset the two colors so they can be compared. The backdrop is the 2013 Google Earth image. The comparison is striking. The paddock trees have hardly changed over the past 65 years. But trees have regenerated densely along the roadsides. The location of trees in 1948 (in red) and 2013 (blue). The comparison is even more striking when the colors are changed. 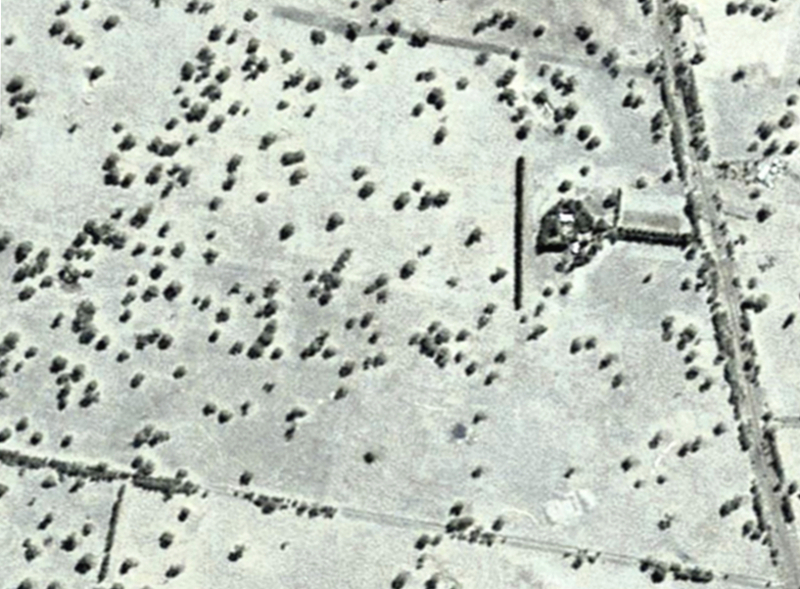 In the photo below, the blue dots show the old trees that were present in 1948 and 2013. 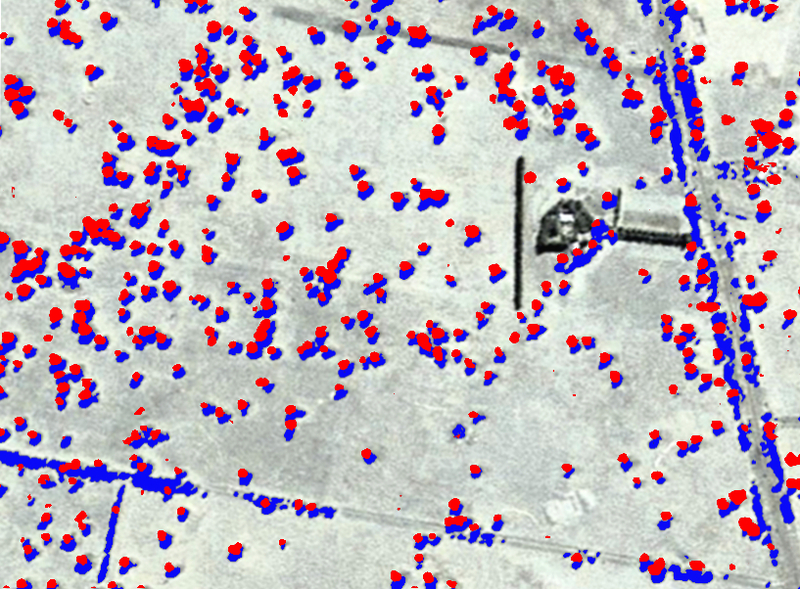 Green shows the new trees that have regenerated since 1948, and the red dots show those that died since 1948. Generally, the paddock trees have been very stable; most of the old trees still survive. But not all of them. About 7% (approximately 31 of 428 trees) have died since 1948. On average, that’s a death every two years in this small area. As time marches on, that death rate can only increase. The biggest worry is: there isn’t a single new tree in the big paddock. All of the paddock trees are old. The only new trees are along the roads. The only new trees (in green) are along the roadsides. On one hand, the apparent stability of the paddock trees is a wonderful thing. With careful stewardship, the region’s farmers have saved the beautiful old trees, and preserved the region’s picturesque landscape. But this stability masks a deeper problem. For about 60 years before 1948, few trees regenerated in the region (or anywhere else), as hordes of rabbits ate the young plants. For over a century now, the paddocks of Dunkeld have been starved of young trees. Imagine a landscape where hardly a single tree regenerated in a paddock in your lifetime, in your parents’ lifetime, and perhaps in your grandparents’ lifetime. That’s Dunkeld. Now imagine a landscape where hardly a single tree regenerated in a paddock in your lifetime, in your children’s lifetime, and in your grand-children’s lifetime. Is that paddock also in Dunkeld? The old trees of Dunkeld are like candles in a monastery, religiously kept alight. But with no new candles being lit, one by one, each flame splutters and dies. And when they go, we have a century of failed regeneration to make up for. Fortunately, for my generation, old red gums are long-lived. This longevity is the iron lung of the woodlands; the life support system that keeps an increasingly old population alive. When that iron lung finally gives out, there are no new seedlings, no young saplings, no small trees – except along the roads. With no new recruits, the landscape of Dunkeld is changing from a pastoral woodland to treeless paddocks dissected by narrow roadside strips. The woodlands of Dunkeld bear the weight of a generation gap 100 years wide. We can’t fill that gap. But we can belatedly heal it. If we don’t, the woodlands won’t go on forever, but will peter out as the grasslands move in from the south, the west, the east, and the center. We owe a huge debt to the farmers of Dunkeld. Their stewardship has kept the trees of Dunkeld alive for over a century. But stewardship of the past creates no future for the trees of Dunkeld. The Dunkeld woodlands need stewardship and more. They need some Succession Planning (and planting). Without a rapid transfusion of new plants, the beautiful woodlands of Dunkeld are doomed. That’s a heavy legacy for the good farmers of Dunkeld. This story was initially posted in early 2013. My apologies if you’ve read it before. I hope you enjoyed it. The beautiful photos of old trees in this post were taken by photographer Richard Crawley and were downloaded from the National Library of Australia’s Trove website. You can view more of Richard’s superb photos of trees in the National Library of Australia at this link and at Richard’s personal website. I am most grateful to Richard for his permission to use his photos in my blog. The copyright (all rights reserved) for the red gum photos is held by Richard Crawley. Previous In the future, how will restorationists think about the past? Next Goodbye world – this is my final blog. Hi Ian, still my favourite blog post of yours! Inspired by this blog, I had a 3rd Year student project down that way last year (Dunkeld area including Cavendish, Glenthompson, Hamilton) trying to figure out whether the paddock tree loss was a) widespread and b) how bad the problem might be. We used aerial photos from the 1950s, matched with Google Earth images, at 35 1 km2 randomly selected sites. We found that overall, tree loss in paddocks outweighed gains (not unexpected; we didn’t look at roadsides like you did). On average, we found that tree declines was about 24% – there were now about 80 trees per 1 km2 compared to about 104 trees per km2 in the original photos. All 35 sites lost trees, but 23 sites gained them (at low numbers) – I assume these were mostly areas where fences had gone up around dams, etc. While we can’t account for the causes of loss, many trees could still be seen in the Google Earth images (and their pattern was pretty random), so I am guessing that they have died of old age in many cases (perhaps magnified by stress induced by drought, etc). I must admit, I felt quite emotional after reading your reflection on this area as many of my Father’s relatives were early farmers there and it pleases me greatly that the trees were recognised as such an important asset and have been honoured and cared for over many generations. Gazing out upon my two acres which was bare ex farmland, I am proud to have planted about 200 trees, the vast majority of which are native. The ecology has multiplied and gained complexity over 15 years and is thriving ecosytem of flora and fauna which I feel immensely proud to have facilitated. 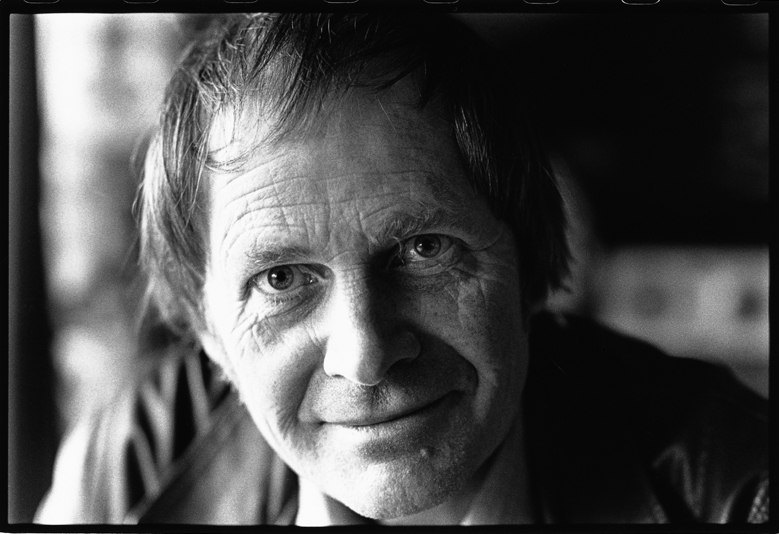 Farmers hold a remarkable responsible and opportunity to create ‘new candles’ which will somehow repay a debt of gratitude to the land upon which they’ve earned their living thus ensuring a future not only as farmers but as humble ‘ecologists’. Our life depends and thrives in harmony with our surrounds and the sooner we all grasp this concept, the more prosperous will be our future. Nice work Ian. I wonder why many woodland eucalypts (and bloodwoods) regenerate so readily in grazed areas in Queensland, while their counterparts in Victoria do not. I suspect its either the impact of the dominant grazers (cattle and macropods in Qld vs. sheep, rabbits and roos in Vic) or the timing of the dry season (cooler months in Qld, hotter months in Vic). Or the combination of both. What do you think? Lovely post Ian – I missed the first one but having travelled through the area you are speaking of merely days ago and marvelling at the stately stems of the river reds, this was an excellent read to put it all in perspective. One question I have though – what would this woodland have looked liked pre-European settlement? Obviously we can deduce there would be more smaller stems, but do you think the number of ‘large’ trees per hectare was similar to that seen in 1948? As I read this post Ian, I repeatedly thought to myself, ‘I’ve read this somewhere before’ and even went back to check the date you had on it, convinced I’d somehow clicked on an old post – until I got to where you admitted using it before! (Light-bulb moment and not me going off my head.) But now I will make the observation I was going to make on the first posting of this interesting piece but was too busy/lazy to do….you were saying not much has changed in the ‘before and after’ photos, except etc….but if you look at the size of each tree you can actually see quite a lot of growth in actual tree size even given how tiny the dots are! What a great techno age we’re in. Great article, Ian. Also nice to know that John Morgan has had his students take a wider view of the River Red Gum landscape in the region. One question from a reader was how the 1940s or 1950s tree density data related to pre-European densities. Since most of the areas surveyed were probably not cropping areas, any stumps left from logging for sleepers (e.g. 1870s to 1930s) would probably be still evident. The same might be said for most trees that died before 1950 – while wood cutters may have cut down the tree for firewood the stump is likely to have been left in those days. Stumps present in 1950 may be visible in the photos – stumps are still visible in some Red Gum paddocks near Hamilton where logging occurred from the 1900s. The data John mentioned suggest a minimum of 1 original River Red Gum per hectare. That is somewhat less than the oft-mentioned value of 5-10 in a heavily wooded landscape – but it may be correct as an overall average. Hello Rod, thanks for your thoughts. Red gum stumps are pretty hardy so I would be fascinating to know how many persist in the paddocks. In many regions the old stumps were burnt out to remove harbours for rabbits, so that might be another source of loss perhaps. As you say, the average density in the 1940s that John’s team found is surprising low, it would be interesting to know how many trees died before then. Thanks again and best wishes, Ian. I found this fascinating, and the photographs are beautiful. Those magnificent scattered trees are so much the vision of the landscape that I knew as a child. Our trees have died much faster, though. In a few more decades, our only trees may be the ones in little jails protected against the sheep. The other factor in all this is the impact of Phalaris. I suspect the long roadside grasses in the later aerials are predominantly if not exclusively Phalaris. Phalaris was introduced as hay in the late 1800s (according to Viridans) and was widely promoted and sown from the 1950’s (after the first aerial), as long paddocking was giving way to increasing traffic. Phalaris is most productive when intensely grazed in rotational systems that are not going to allow regeneration of trees. Un-grazed Phalaris is very dense even under trees, and poses a problem when seeking regeneration by fencing paddock trees. Eloquently beautiful evocation of this place and fascinating piece of historical research that reminds me a bit of Bill Gammage’s book Greatest Estate on Earth. Is predation by rabbits or overgrazing the main culprits in terms of the lack of river red gum saplings? Or is climate change a factor? Wonderful, touching work sir. Marvelous, insightful comparison. A fantastic example of putting the archives to work, always in new and creative ways while tipping the hat to tradition and scholarship. Good to read this. I grew up with these pastoral scenes and they are some of the most beautiful in Australia. My wife and I were driving through this area just a few weeks ago and I commented that despite the longevity of the individual red gum trees, I was worried about regeneration in the paddocks. With the huge seed rain from these trees it would not take too much effort to use small enclosures next to trees to allow seedlings to flourish. However, allowing sufficient time to allow seedlings to reach a size capable of withstanding grazing and trampling by stock would take some years. The cost of such measures should not be borne solely by landholders but could be supported by grants aimed at supporting landscape recover. Just needs a good person like you to help coordinate something like that with the community! !